← Question #8: It seems to me that those who promote Exclusive Psalmody have stirred up a lot of friction in the church. Why is the Exclusive Psalmody movement so divisive? 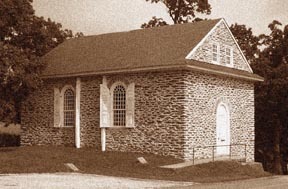 Guinston United Presbyterian Church, built in 1773. This was one of the pastorates of Rev. Gordon Alexander. Originally ARP, then UPC, the church is now PCUSA. “Mr. Gordon was born in Montrose, Scotland, in the year 1789. He says: “My parents and grandparents on both sides were poor. My mother, Helen Hampton, was of a weakly constitution. My father was lame— from which, at times, he suffered great pain, and was frequently unfit for labour. His earnings, which would not exceed, but often fell below fifteen shillings sterling per week, were all the means of our support, and there were eleven of us, of whom seven died in childhood Being the oldest who lived, as soon as I was capable of giving any assistance it was both needed and required. At the age of four years, I began to follow my father to his employment, which was that of a thread miller, at which I continued to labour, as I could, for eight years. My earnings, till my twentieth year, went wholly to my father; consequently I had not the means of a common education in my youth. “But my parents and grandparents were, I trust, religious, and continued constant in the duties of their scriptural profession, which was that of the Secession church, and of the antiBurgher side. And I was carefully instructed according to it. Being immediately under my parents till I was thirteen years of age, my words and actions and company were strictly watched, which I then thought was a severe restriction. I do not recollect how early I was taught to use the Lord’s prayer. At the age of seven I could use the form of asking a blessing and returning thanks at meals for myself and brothers. No deficiency in dress, and scarcely any extremity in the weather, exempted me from attending on the public ordinances of religion. At family worship I was required to repeat some part of the chapter read. On the Sabbath evening I was required to rehearse what I could of the public discourse. “August 18th I was ordained to the office of the ministry at Guinston. This was another solemn and express devotemen^ of myself to a witnessing profession—but which, at that time, had not a due weight on my mind. I: was already caught by the popular enthusiasm,, and wished to distinguish myself as an advocate for all those liberal measures by which I thought this happy age was triumphing over bigotry. And my conversation, preaching, and prayers were full of it. O what a fool and how inconsistent I was! But God was preparing to break the charm, and set me again free. There was no place or house belonging to the congregation, and I was, or thought I was, under the necessity of buying land and building a house. The latter was a tedious, troublesome, and very expensive business. It brought me much in debt, and greatly harassed my mind, and became a great diversion from study. It gave me occasion, many times, to know what people really are. And while I was in trouble of another sort, these matters were also in progress, and tended greatly to increase it. “There was a minister belonging to the General Assembly in my vicinity, whom, for his talents and soundness in doctrine, I esteemed, and he in turn commended my liberal views. We met, on an occasion, for the examination of the Sabbath Schools. Mr. M., in his part of the service, was pleased to sing Dr. Watts’ compositions. I was liberal to my shame and sorrow, but not so liberal as that. But ‘the backslider in heart is filled with his own ways,’—and I now was. I felt it at the time to be God’s reproof. Although I had several times publicly inveighed against human compositions, it did not hinder the people, (my own and others,) from believing that I was, at this time, conniving at the practice, because I was co-operating with one who was opposed to strictness in profession. “Several other trials now came upon me at once. The persecuting tongue was set against me. The occasion of this seemed to be the little book I had published on the psalms. Attempts were made, first, to destroy my character and usefulness, and, when that could not be done, to destroy my credit. In the short space of six months, seven suits were brought against me for debts, some of them real, but most of them pretended. For a length of time I was kept in fear of being sold out by the sheriff. This fear at length induced me to sell out, myself, and owe no man any thing, and leave the place. Upon looking back on these thoughts, I am disposed to ascribe them chiefly to the spirit of free masonry, which I had previously attacked in a public discourse. This entry was posted in Alexander Gordon, Biographies and tagged 1822, ARP, authors, debates, Exclusive Psalmody, ministers, UPC. Bookmark the permalink.